"In our quest for knowledge, We cross the fields of the Earth Mother, And play in her forests.... Her pulse is in the gardens, Her dance in the jungles and from the deep within Her, Springs knowledge as the fruits of the Earth.... Slowly She dances the seasonal rhythms, To the gentle music of the Woodlands. Pan plays upon his pipes, And She dances in the grasses, Among the trees, To the tune of the Gentle Hunter.... Our Mother is the Earth and we are Her children: She gives us wisdom. May we seek Her knowledge in the flowers, And in the green things.... And in the passing of time. 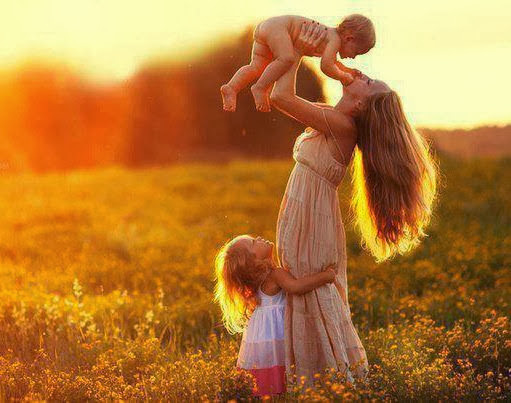 When we give to Her our souls, She will take our bodies, And plant them for her flowers...."
Easter falls on the first Sunday of the full moon that occurs on the day of the vernal equinox (21 March) or any of the next 28 days. This marks the changeover point between the light and the dark halves of the year. This now Christianized holiday that we call Easter was usurped from the Aryan pagans at the Council of Nicaea in 325 C.E. but still retains the roots and traditions of its origins. The true Easter is a celebration in honor of the Anglo Saxon Sun Goddess Eostre, Eostur, Esotara, Eastue, Eastur, Austron, Ausos, Oestre, Ostare, or Ostara. The origin of the name Eostre is derived from the word "east" originating from various Austro-Hungarian words for dawn that also share the root for the word "aurora" which means "to shine". As Sun Goddess and Mother Earth deity, Eostre is found to be quite similar in the character to Frigga or Holda in the Teutonic pantheon. 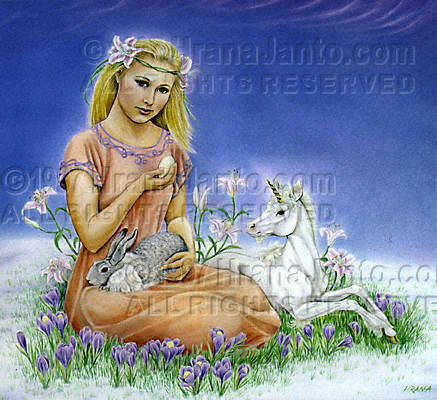 In other areas of ancient Europe Eostre was known as Brechta, and Bertha of The White Lady. Both March and April are the time of the year when the sun impregnates and fertilizes the earth generating new life, "The Rights of Spring". The pagan Spring equinox has since been overlaid and muted by the Christian penitential season of Lent and Holy Week. The traditional Maypole symbolizes the phallus while the multi colored streamers from the pinnacle of the Maypole represent the male sperm fertilizing the female Earth. Here we find what is known as the "Hieros Gamos", (the sacred marriage). The male role now exhibits his importance as he who fertilizes the woman and the land, for without him both remain barren. At the same time it is a day to pay additional homage to the god given beauty of women which through all of eternity fulfills every possible desire of the male species. The painted Easter egg to this very day retains its symbology of the Spring Equinox, representing new life and rebirth just as the hare, now portrayed as the white Easter bunny has always been symbolic of fertility. The origin of egg painting at Easter began, as legend has it, when Eostre once found a wounded bird, on the ground in late winter. To save its life she transformed it into a hare. But the transformation was not a complete one. The bird took on the appearance of a hare but retained the ability to lay eggs... the hare would decorate these eggs and leave them as special gifts once a year to Eostre. Eostre's lights, as Goddess of the Dawn, were carried by hares. Druids were known to dye eggs scarlet red to honor the Sun. It was also an old pagan custom to place colorful patterned eggs in tombs or on fresh graves, to ensure the rebirth of the deceased. The custom of eating hot cross buns has always been a traditional custom of Eostre and Easter. The Saxons ate buns that were marked with a cross in honor of Eostre. The ancient Greeks also consumed these types of buns in their celebrations of Artemis, Goddess of the Hunt (known as Diana to the Romans). The Egyptians ate a similar cake in their worship of the Goddess Isis. The cross on the buns represent the four quarterly seasonal cycles of the year. Eostre's reign over the Earth began in the spring when the Sun King journyed across the sky in his chariot, ushering in the end of winter. Eostre came down to Midgard (earth) then appearing as a radiantly beautiful maiden with a basket of bright colorful eggs. The companion of the Goddess was a white hare who accompanied her as she brought new life to dying plants and flowers by hiding the eggs in the fields. Eostre represents spring fecundity, and love and carnal pleasure that leads to fecundity. The revival of Nature is as certain as its decline, and its alterations are subject to the appointment of a power which controls both. 4 I live life rightly and nobly without guilt or fear. My libido and creativity are energized. The vital spark of my being is supercharged. Today I focus on balance, health and youthful vigor. I embrace life in its absolute divine beauty and fullness. I find my path by following my ethnic spiritual inclinations. Most often the patriarchal gods have been traditionally and symbolically identified as the Sun, whose fertilizing rays impregnate the receiving Mother Earth and produce life. Eostre, unlike most all other matriarchal deities remains representative as both Sun and Moon all in one. Many of the far distant gods were at times known to be androgynous in the earliest beginnings which may be a factor as to why some female deities are Sun related and Eostre is certainly a very ancient deity. At this current time in history it has now become firmly established that the moon and earth are most always symbolic as female and the Sun and sky as Male. In the body, the Sun rules the heart, the spine, the right eye in a man and the left eye in a woman. All the patriarchal one-eyed gods such as Wotan Horus and Ra all display the right eye, as the solar eye. "At the Spring Equinox, the light equals the darkness and this can be taken both as a representation of the Goddess meeting the God, but also as an emblem of the God's evolution. He is at the equipoise between unconscious animalism and growing conscious awareness. It is at this festival that he impregnates the Goddess but, although coupling with her, he does not stay with her. He continues roaming the greenwood, as the Horned Hunter." As Sun Goddess, Eostre is often depicted with seven rays of light forming the crown on her head. Lydia, the mother goddess of Zeus also wore the seven rayed crown though most people today have almost no idea that it too reveals the ancient pagan image of the sun goddess Eostre. The Statue of Liberty in New York City, unknown to most Americans is in fact the sculpted image of Eostre complete with her seven rayed crown. And the Goddess Eostre breathed gently into the void; and behold, the gentle breezes caressed the soul of the Universe. Thus was born the essence of light, of laughter and cheer.... The Mother Goddess image of Eostre will forever come to surface through all history because not only is she an immortal, playfully kind and protective spirit, but absolutely necessary to mankind. She likewise represents the eternal constant of the dual polarity between both male and female. It is for such reasons that the Roman Catholic Church never abandoned the importance of the pagan concept of a Mother Goddess as did the Protestants but rather conveniently changed her former pagan name to a Christianized Blessed Mother Mary. A Goddess of many names her essence remains the same....she is a symbol, and when you see her you know her instantly, no matter what title she may bear. So very much of religion and mythology is symbolic. Symbolism is the language of the Mysteries; in fact it is the language not only of mysticism and philosophy but of all nature, for every law and power active in universal procedure is manifested to the limited sense perceptions of man through the medium of symbol. Every form existing in the diversified sphere of being is symbolic of the divine activity by which it is produced. The Great Arcanum was always concealed in symbol or allegory; and those who can today discover its lost keys may open with them a treasure house of philosophic, scientific, and religious truths. Neither time nor dominance by either politics or authoritarian mainstream religions can ever hinder the resurgence of the ancient Aryan pagan Mother Goddess. The poet W.B. Yeats described the calling of our inner natural pagan spiritual ethnic roots as "the revolt of soul against intellect." By this definition as author Peter Haining points out, "Yeats meant those people who had experienced increasing disillusionment with the materialistic world in which they found themselves and sought an older and purer form of satisfaction in the principles of good and evil. Their search was one for the ancient practices of man when the mind was less inhibited, when the dark still held an aura of mystery and the inexplicable was not dismissed by bland rationality; when man found the root of his beliefs in the seasons around him, and the changes in his world were the direct cause of superior spirits who required worship and understanding." Only a constant and unselfish inner asceticism enables man to overcome the strong grip of materiality. He can be his real self, only if he forgets himself and gives himself to his destiny. The Norse goddess Idun (also Idunna) is another likeness of ancient Eostre and likewise represents the personification of Spring or Immortal youth, who according to some mythologists, had no birth and was never to taste death, and was warmly welcomed by the gods of Asgard. In the myth, Idun's fall from Yggdrasil is symbolic of the autumnal falling of the leaves, which lie limp and helpless on the cold bare ground until they are hidden from sight under the snow, represented by the wolf skin, which Wotan, the sky, sends down to keep them warm; and the cessation of the birds songs is further typified by her husband Bragi's silent harp. Idun not unlike Bridget the Mother Goddess of the Gaelic Brigantes, and others is just another identity for the most ancient goddess of Spring. Perhaps this is why we will never really know the exact time and origin of Eostre as she is timeless and has always existed. To become conscious, even for a few fleeting moments of time, of the God and Goddess life mirrored both within us and from without, means the beginning of the reversal of our spheres, An awakening! "From the deep waters, Of Her eternal wisdom, Brings forth, The mystery of life, And thus does the initiate, Take on the Quest of All-Knowing.... From the Cauldron of Cerridwen, We take compassion and love. Moving deep within the Mysteries, We seek inner knowledge.... May the God Poseidon, (Neptune, Njord) watch over the Seeker, As the initiate plunges into the depths of knowing.... Our Mother's reflection upon rippling waters.... May we eternally be bathed, In Her love.... May we seek her calm, Her tranquility, As we travel from shore, To distant shore...."
and pleasure are my rituals, And therefore let there be beauty and strength, Power and compassion, honor and pride, Mirth and reverence within you. And you who think to seek me, Know your seeking and yearning shall avail you not, Unless you know the Mystery: That if that which you seek you find not within you, You will never find without. For behold, I have been with you from the beginning, And I am that which is attained, At the end of desire." "Light begins, On the dark side, Of despair, Muffled, In shadow, Like an ember, There. As it glows, Soon it grows, To a radiant, Sun, Lifting dark veils, Where despair, Had begun. And it warms, From without, And it warms, From within, Bringing light, To man's life, Where all sorrows begin."